How can cloud consumers directly interact with data stored on a cloud storage device or provide access to other cloud consumers with appropriate permission levels? Cloud consumers may not own or have permissions to the cloud-hosted storage devices that contain their data. This can limit their ability to access and manage datasets important to their business. A solution is provided that enables cloud consumers to directly interact with data stored on a cloud storage device. 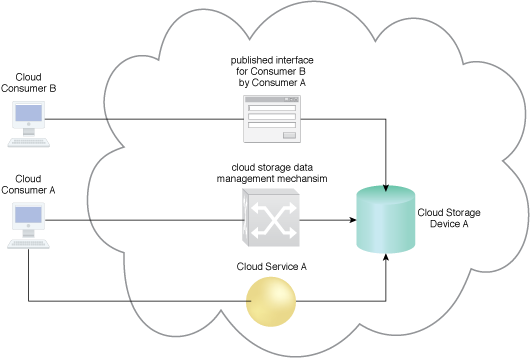 A cloud storage management portal mechanism can be used to provide an interface or APIs for cloud consumers to interact with data stored on a cloud storage device. A cloud storage management portal mechanism provides the access for cloud consumers to manage data stored on a cloud storage device.